How do I download latest data and settings from the online store and QuickBooks in Unify? 1. The Attribute set shown here is for Magento. Please remember that each shopping cart will have a different attribute set (Data to Download from store). 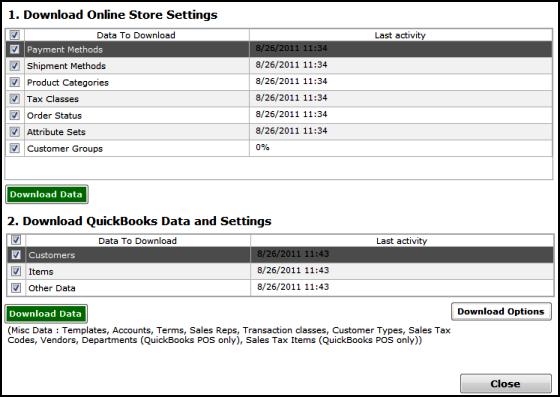 Use this screen to get latest configuration data from your Online Store and QuickBooks. To download latest configuration go to File>>Configure Profile>>Download Settings or else go to File>>Download Latest Configuration. Unify uses this data to populate various drop down options and help you easily configure the latest settings for order synchronization.